Firstly read the Bootstrap 4 Tutorial: Working with npm, Grunt.js and Sass (Part 1). Bootstrap 4 comes with an official Sass port for the framework. 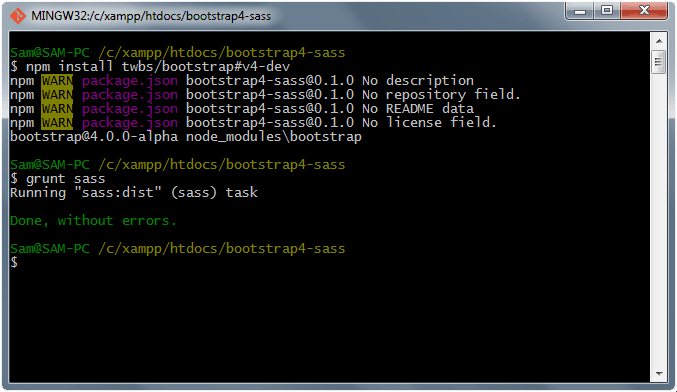 If you are not familiar with Sass, implementing it via Bootstrap can be a little tricky. In the previous article, we installed, configured and customized npm and Grunt.js setups for faster development. In this article, were going to deal with Compass and Sass as well as implement a watch task to watch for changes and run the tasks it needs to. At the end of this tutorial, were going to come up with Bootstrap 4 theme that is built with Sass. "text-intro opacity-0 btn btn-primary" data-target="main-content" href="#"
<input class="form form-control" data-name="Name" id="name" name="name"
<input class="form form-control" data-name="Email Address" id="email"
Download Bootstrap 4 alpha using the git branch v4-dev. Open your terminal or command prompt and inside the project directory type npm install twbs/bootstrap#v4-dev and the package is downloaded directly from GitHub to npm_modules folder. Now that we have the Bootstrap 4 package, let’s move the scss folder inside the Bootstrap package to our sass folder so that we can have access to all of the main core files of Bootstrap Sass. If you want to simply import the compiled bootstrap CSS file –bootstrap.min.css or bootstrap.css to the custom .scss files that would also work. Let’s also import the Google Fonts links that we need inside the _typography.scss file. Work on the variables for our Sass. Inside the _variables.scss file, copy the code below. Then for mixins, let’s add the following code inside the _mixins.scss file (which is inside the helper folder). Finally, we’ll work on our main file which is the style.scss. We will start by importing our support .scss files along with the regular CSS via Sass variables. Going back to our Gruntfile.js, we set up Compass and Sass using the following code below. These code will set the path linking to our style.scss file and style.css file and we enable Compass by setting up compass: true on the options of grunt sass. The final thing we need to do is to create and set up a config.rb file for Compass inside the project directory. This file defines the relationship between files and their assets, how and where the CSS should be generated, and any dependencies for a project via Compass. Copy the code below inside the config.rb file. Finally, compile .scss files to one CSS file, go to your terminal or command prompt and inside your project directory type grunt sass. We can also ask Grunt to watch for changes and run the tasks it needs. The watch task will run every time a file is changed and saved. Since the configuration was already set up on our Sass files we just need to simply type grunt watch on command prompt or terminal. You can download the demo files here. Bootstrap is a great CSS framework that you can use to build a website, and using the SASS version lets you do almost anything you want. Thankfully, task runner like Grunt.js makes the work much easier if you take time to learn the simple commands. Hopefully this tutorial has helped you understand npm, Grunt.js and Sass and how it can speed up your Bootstrap development. If you have any questions or suggestions, drop a line in the comments. Be careful if you use NPM v3 on pre-existing projects. The NPM overlords have decided that you cannot nest your dependencies. If you accidentally upgrade from v2 to v3, it will completely reorganize your project. This can break things and, if you have an organization you prefer, you’re screwed. 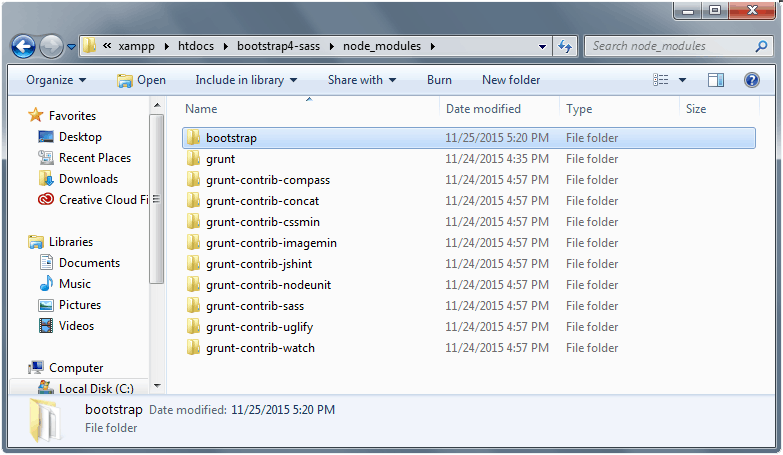 I have setup up grunt, compass, auto-prefixer etc before for a non-bootstrap project using watch from the command line. On recent projects I have opted for using Sublime Text and it’s packages instead, which seems a darn site easier. It is appreciated the effort and time you have put in to this tutorial, but what a nightmare? It’s far too complicated — for me at least. Is this the most basic of setups to get you going with bootstrap 4 and npm? 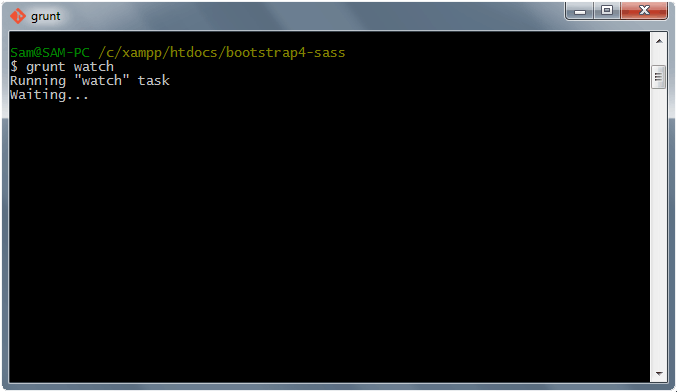 Hi, i have setup project according to your instructions, but when i run grunt sass. it’s shows error: Cannot load compass. Please help me to resolve this issue…. I have the same error an -d I am on OSX. Warning: Exited with error code 1 Use –force to continue. There is a big problem with tool compatibility. 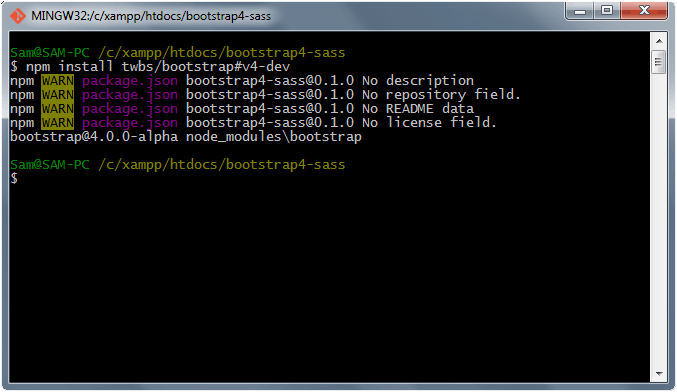 It concerns the compass-sass-scss relationship. 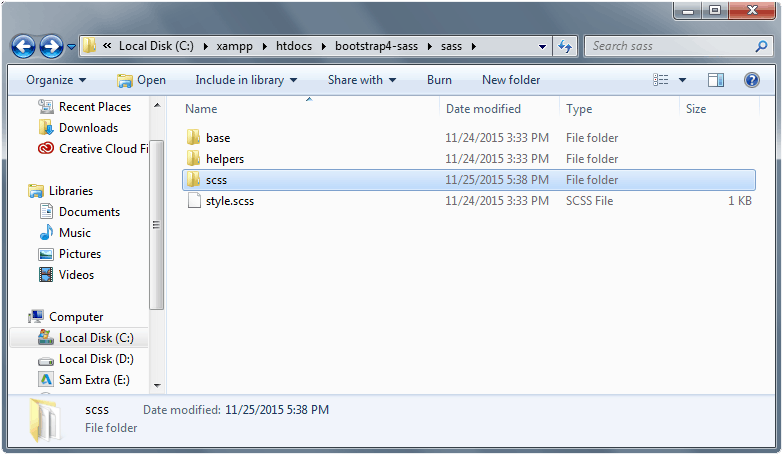 If you have the current version of scss and a compatible sass preprocessor then the compass does not load. If we grab compass and sass versions and they start to work properly, there are errors in the interpretation of the scss code. I guess you have to give up the compass because it cannot even maintain compatibility with bootstrap sources in the alpha version. Besides, the article is great.